I grew up watching TV shows like Hogan’s Heroes, McHale’s Navy and M.A.S.H. At the time, it did not occur to me that the popularity of war comedies might be an indication that there is something fundamentally wrong with humanity. Not that there is anything wrong with laughing at war, per se. Laughter is, in fact, a crucial coping mechanism for dealing with such horrors. But that there has been a steady stream of horrors in need of comedic healing seems to be the problem. So when it came time to start dealing intellectually with such heavy matters, science fiction was there, as it was for so many of the issues I grappled with during my formative years. And it did not take long before I started hitting the hard stuff, Bill the Galactic Hero, Slaughterhouse Five, The Liberation of Earth and the subject of today’s Scide Splitters – Who Goes Here? by Bob Shaw. All classics, all dark, and all funny as hell. Who Goes Here? begins with the protagonist, Warren Peace, at a Space Legion recruiting center with no recollection of why he is there or even who he is. Much like the French Foreign Legion of old, men of the 24th century join the Space Legion to forget, only now they do the forgetting more efficiently with a device that wipes out all memories related to the guilt of whatever it is that the recruits need to forget. Any crimes they have forgotten are legally absolved, but in exchange, the recruits sign on for a thirty year stint in the Legion. After a hilariously short training camp, the recruits are shipped off to war. Faced with suicidal orders and comically nasty creatures, it quickly becomes obvious to Warren that he will be dead in a matter of weeks. His only chance of survival is to solve the mystery of who he is and what he has done to get himself in this mess. To make matters worse, Warren Peace has a propensity for misfortune. Every time things are looking up, some mishap comes along to put him right back into the fire. This leads to a fast paced plot with lots of twists and turns. The plotting and action are such that even if you don’t get the humor, you will likely still enjoy the story. The early chapters are reminiscent of Harry Harrison’s Bill, the Galactic Hero. This is partly because both stories deal with reluctant recruits and sadistic officers. But the two also have similar humor styles and both engage in parody of SF tropes. 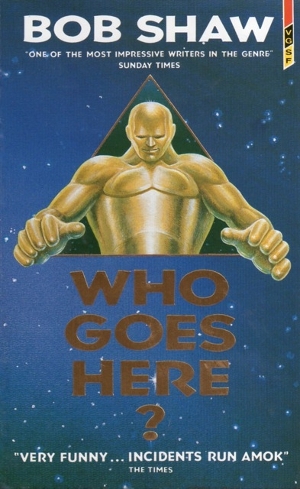 I usually don’t like to make the claim that “if you like x, then you will like y,” because it often turns out not to be the case, however, I am fairly confident that if you enjoyed Bill, the Galactic Hero, then you will like Who Goes Here? There is one other similarity I should mention. Both authors were tempted into making sequels many years later and in both cases those sequels aren’t worth your time. 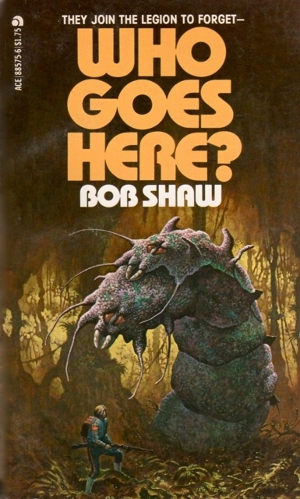 Bob Shaw’s Who Goes Here? is a SF parody filled with action and laughs, an underappreciated classic that deserves the attention of a younger generation of fans. Unfortunately the novel has been out of print for some time. The good news, however, is that the novel is now available in digital form, and for those of you who prefer the old fashioned dead tree, used copies are both plentiful and inexpensive.